The kids are out for summer break and we are finding simple and fun activities to fill our days. 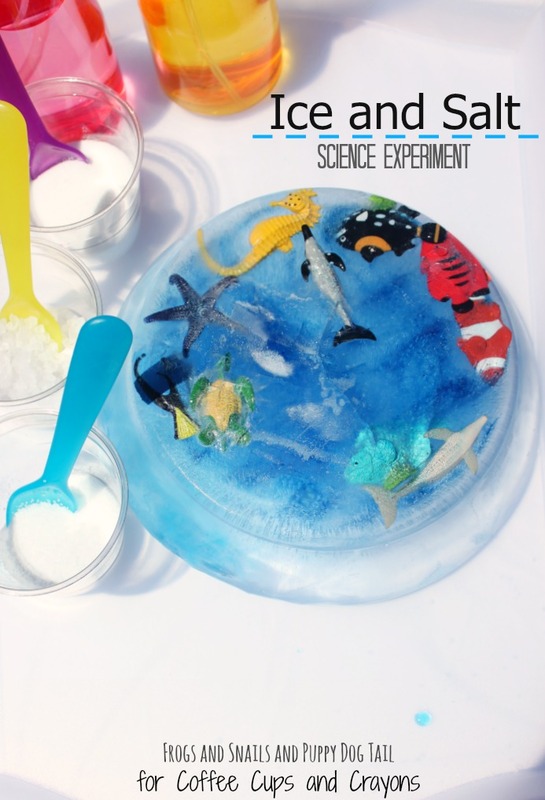 This ice and salt science experiment is just that–simple and fun. 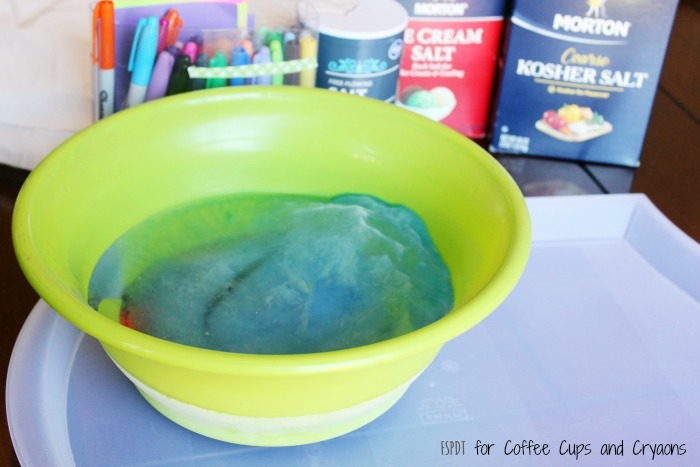 My kids love simple science experiments and this one was enjoyed by all 3 of my kids ages 3, 5 and 7 years old. We set out to find which type of salt would melt the ice the fastest. The kids enjoyed making predictions before we got started and seeing what the final results were. I can see us doing more ice melting experiments before summer is over. 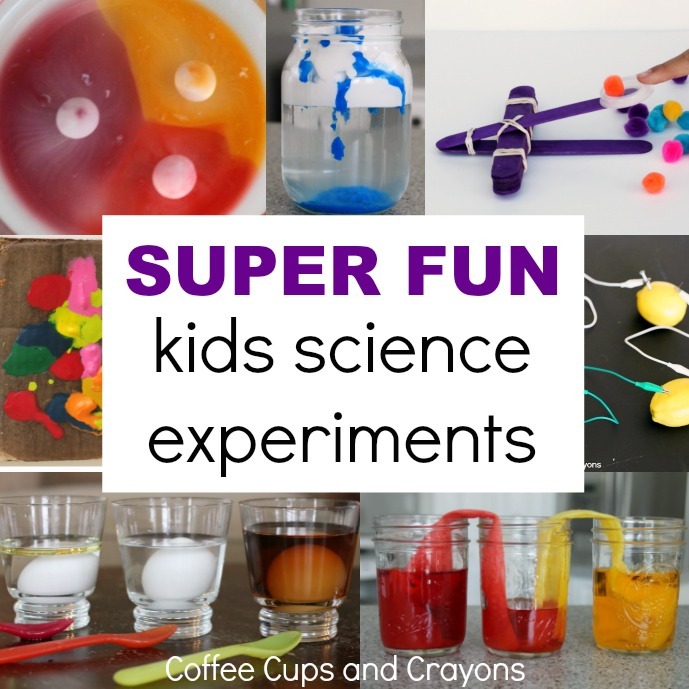 It’s a fun STEAM (science, technology, engineering, art, math) activity for kids. First things first, you need ice to melt. 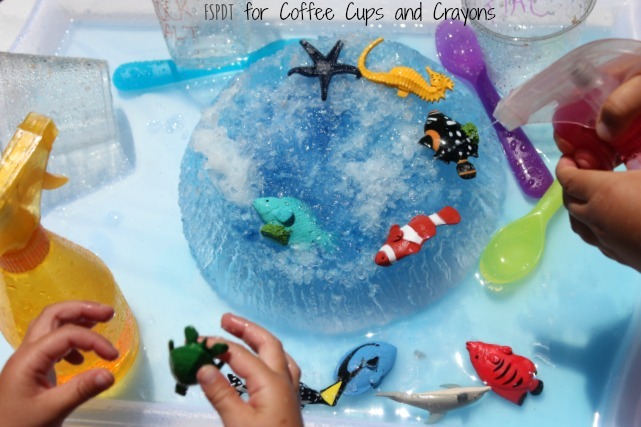 Fill a large plastic bowl with water, blue food coloring, and aquatic animals. 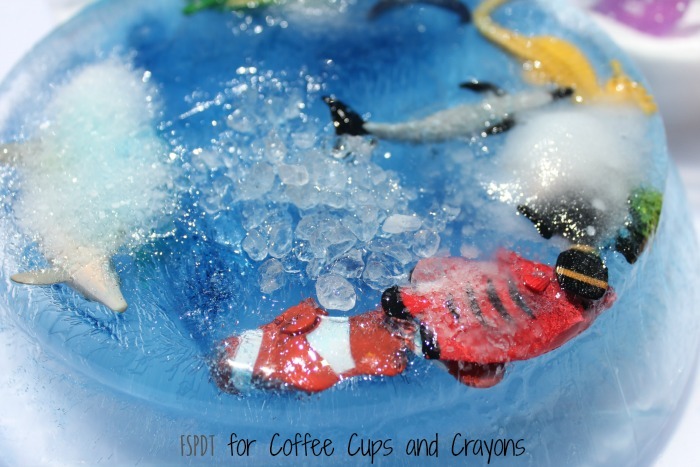 Place it in the freezer ahead of time and come back for it the day you want to do the ice and salt melting experiment. Explain to your kids that when water gets below 0 degrees Celsius or 32 degrees Fahrenheit it freezes going from a liquid to a solid. Once you have your ice you can start your experiment. Set the bowl of ice out while you gather supplies so it will melt just a tiny bit and come out of the bowl with ease. You’ll need a plastic tray, the salts, 3 plastic cups and Sharpie markers. Label each cup with what type salt you will pour in. 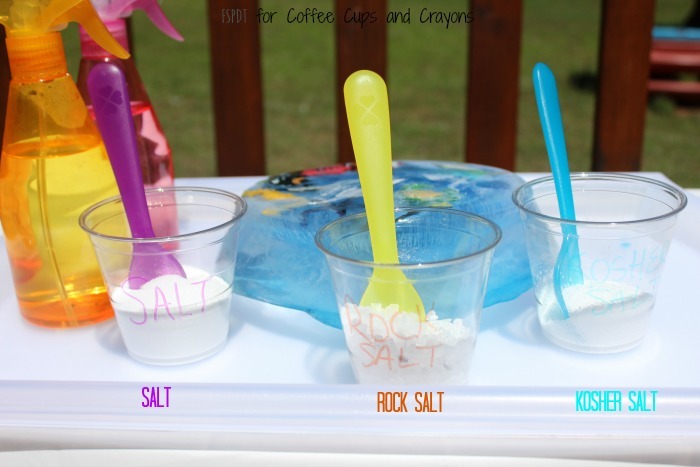 Fill the cups with salt and fill up 2 water spray bottles. 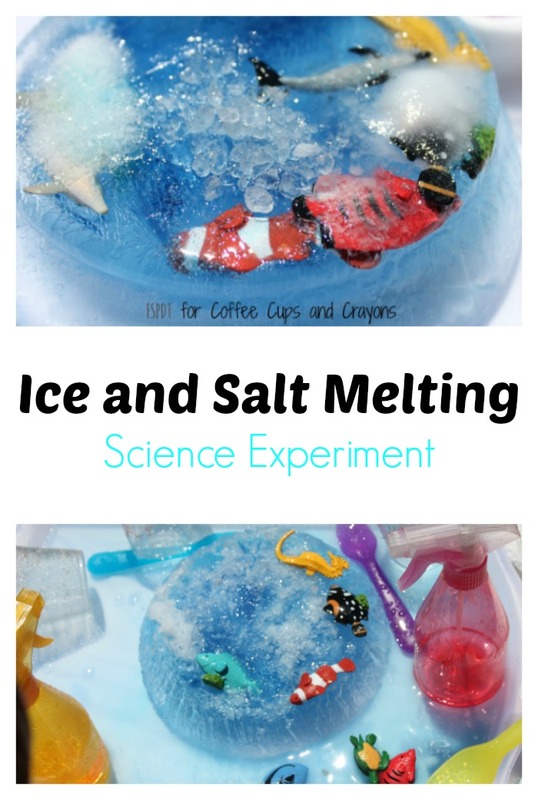 The kids can use them to melt the ice after you determine which salt melts the ice the fastest. Start out by scooping a little of each salt on the ice. Then wait a few minutes to see which salt melts the ice the fastest. Our winner was the rock salt, second place was the kosher salt and last was the table salt. Salt is said to melt ice because it lowers the freezing temperature and disrupts the molecular equilibrium . Different salts have different molecular compositions. Because of this, the different salts melt at different rates. Once we had finished our salt and ice science experiment we went on to enjoy an aquatic treasure hunt. The kids dumped all the salt on the ice by this point and they got the water spray bottles and started melting the ice by spraying it with water. They wanted to rescue the animals that were stuck in the ice. This was a great extension to our activity. Using spray bottles is a great way to let the kids work on those tiny hand muscles they need for fine motor skills. Once all the animals were rescued the kids played with the ice until it was almost completely gone. We had a lot of fun making predictions of which salt we thought would melt the ice the quickest and seeing our final results after conducting this experiment. The simple ice and salt science experiment was a lot of fun and full of learning!